Store bought and even many homemade corned beef brisket recipes are full of unhealthful ingredients including sugar, nitrites, and nitrates. Therefore, in order to not miss out on my favorite part of St. Patrick’s Day–the corned beef brisket–I decided to make my own. This recipe, intended to be cooked in a slow cooker, is actually a brined beef brisket recipe and not actually corned. It is ready to eat much sooner than typical homemade corned beef brisket. And it lacks the familiar pink color. But, since it contains much of the same flavor profile as traditional corned beef might have, it tastes pretty close–without using any unhealthful ingredients. 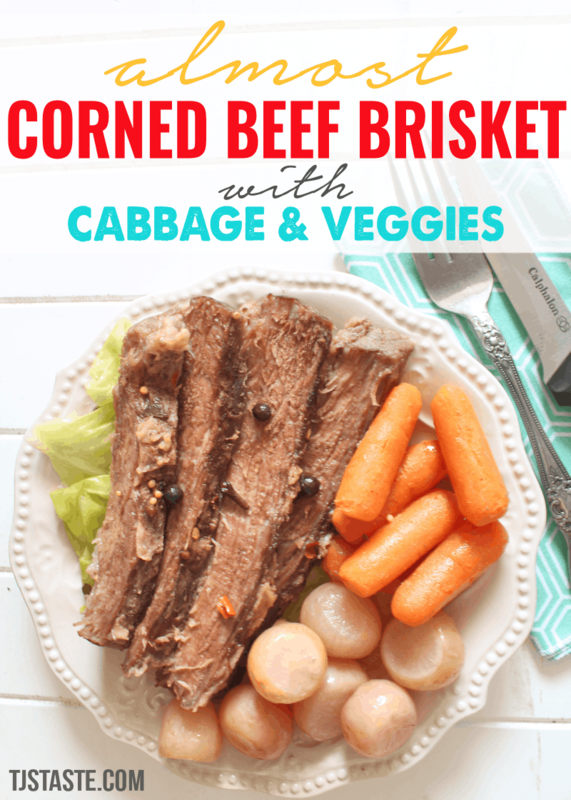 Also in this recipe, you’ll find some cabbage as is the tradition with corned beef brisket and some other veggies. Since potatoes are very high in carbs, I decided to give radishes a try instead since I’ve been told they end up similar in texture, color, and flavor (once cooked with other stuff) to potatoes. And I threw in some onions, garlic, and carrots for added flavor. Place the brisket in an airtight (2 gallon) bag or dish; set aside. Stir the water and salt together until the salt dissolves. Pour into the container with the brisket. Allow to brine for for 8 hours or overnight. Place the onion, carrots, raddishes, and garlic in the bottom of a slow cooker. Mix the water, vinegar, pickling spices, and pepper together in another container. Pour over the veggies in the crock pot. 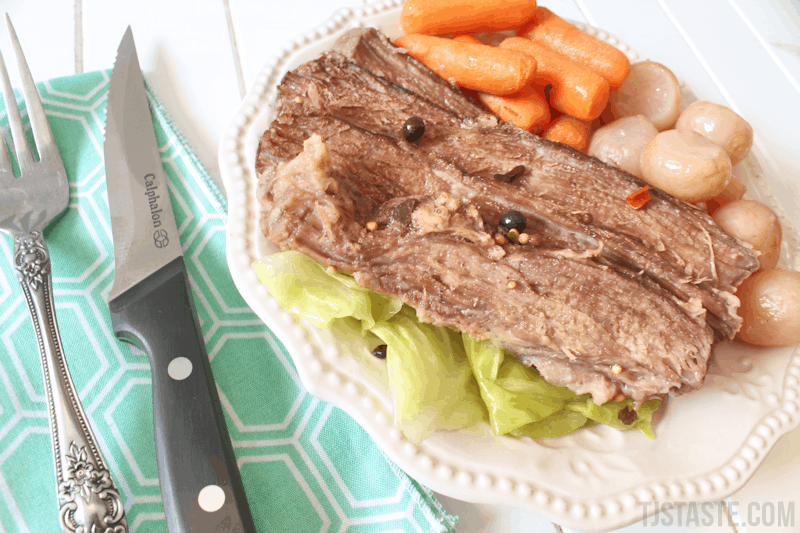 Remove the brisket from the brine (discard brine) and place atop the veggies in the slow cooker. Spread the cabbage over the top of the brisket. Cover and let cook on low for about 6 hours. Pressure Cooker - Place ingredients in a 6 to 8 quart electric pressure cooker. Allow to cook on high pressure for 1 hour then allow pressure to naturally release.